The Targus Digital Camera Cases utilize a series of adjustable, self adhering foam padded dividers that enable you to create customized compartments to hold your digital camera, table top tripod, lenses, filters and power pack. All these are kept in place by a cover with a self-locking tab. There are also pockets specifically designed to hold PC/Memory cards, 3.5"disks, pens/pencils, business cards, manuals and even a separate pocket for CD software. 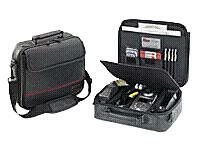 The Targus Digital Camera Cases were created to conveniently carry your camera and related accessories.